This is an excerpt from Prescriptive Stretching by Kristian Berg. As always, it is important to start in the correct position when stretching. Hunching over while sitting prevents you from stretching as well as you could if you were sitting up straight. Be aware of the rotation of your head. When you have turned your head 45 degrees and you are starting to bend it forward, you must make sure that everything is in line so that you do not pull the muscle at a bad angle. The levator scapulae runs between the upper part of the shoulder blades and the top four cervical vertebrae. 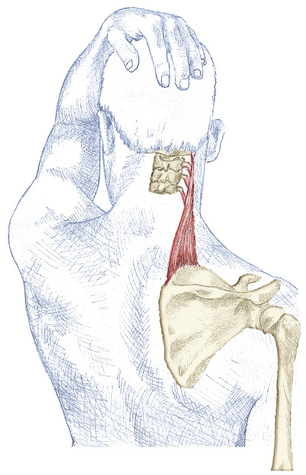 It is a thin, flat muscle located just below the upper part of the trapezius. It rotates and tilts the head to the side. When both sides of the muscle work simultaneously, it raises the shoulder girdle and bends the head backward. The levator scapulae is shortened by bad posture, by permanently raising the shoulder or the shoulder girdle, or by holding a phone between the cheek and the shoulder. Since the levator scapulae raises the shoulder girdle, it also works statically in times of stress since the shoulders are often raised in response to tension. You should be able to rotate the head approximately 90 degrees and to bend the neck approximately 45 degrees to the side. Avoid this exercise if it causes pain in the neck. Sit on a chair or bench with your feet wide apart and your back and abs slightly tightened. Reach behind you with your right hand and grab the edge of the chair. Lean your upper body to the left, keeping your head upright. You will feel a light pull in your right shoulder or upper arm. 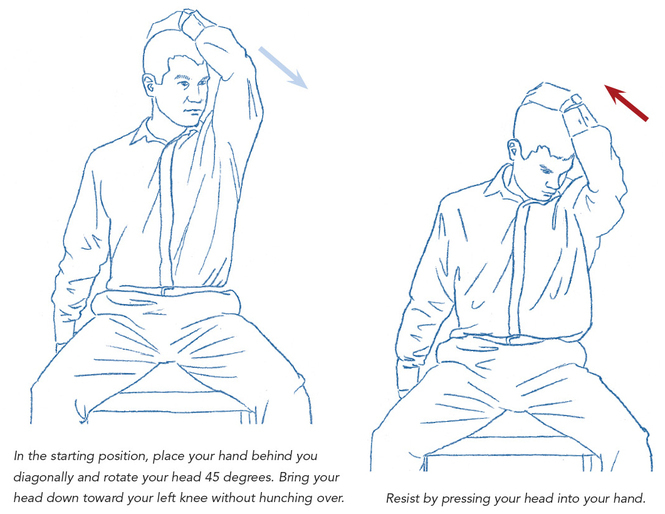 Now try to lift your right shoulder toward the ceiling for five seconds. Do not allow your body to move sideways. Relax for a couple of seconds and then lean your upper body a little more to the side. You have now reached the correct starting position for the stretch. Rotate your head 45 degrees to the left. Place your left hand behind your head and gently pull it at an angle toward your knee. Stretch the muscle in this manner for 5 to 10 seconds. Stop the movement when you feel a slight sting in the right side of your neck. Next, relax the muscle for 5 to 10 seconds. Resist by carefully pushing your head backward into your hand. Next, relax the muscle for 5 to 10 seconds. Deepen the stretch by slowly pulling your head toward your chest in the direction of your knee until you reach a new ending point. This muscle can be hard to stretch if other muscles are tight. If you find this exercise difficult, try to stretch the upper part of the trapezius and the suboccipital muscles first. Learn more about Prescriptive Stretching.